An, as abrupt as short, irritation of people’s everyday shopping grind, which obviously leaves them speechless, not sure wether to ignore this awkward situation or to sink into deep abashment, requesting the “shiny” stairs for help. Betty Boehm was born in 1979 in Reutlingen, Germany. From 2000 to 2008 she studied Fine Arts in Stuttgart, Germany and San Francisco, USA. During the course of her studies, she gained experience in various artistic disciplines, reaching from drawing, painting and installation to video art, acting and experimental sound art. In her work, video and film works are playing a major role, which range from short film and loop to performance. The merge of those with other media like photography, photo montage and sound, as well as their integration in an installative and sculptural context are characteristic for her approach. VIdeo-poem in which the text becomes an image and the image is text. Each frame of the animation was produced by means of the language of the Web: HTML, CSS, SVG. -Luigia Cardarelli, born, lives and works in Tuscania-Italy. He graduated in painting from the Academy of Fine Arts in Rome. Atomic theater promotional video inspired on a cereal spot from the fifthies. Each character does a typical breakfast eating action alonside the special music created for the shots make a vey interest onomatopeia secuence. Actor and theater director, he studied in Theatre School of Fernando González in Chile and have taken courses of improvement in acting and directing in Chile, as well as in Spain. In 2001 he creates the Atomic Theater Company, up to now he is director and actor there, performing eight staging, which have received very good critics of the trade press and the audience. He was part of AdA’s project at Madrid’s Fringe Festival 2012, working alongside Marco Calvani and as Neil LaBute´s assistant director in the production of the play “Things of this World. The same year he won the Fondart 2012 “Chilean Arts & culture fund” with the project “Cabinet Theater” alongside Vania Figueroa and the play “9:45”. Also in 2012 he was involved in an artistic residency in Lithaunia where he prepared “The Alienation Thrilogy” which has been selected for “Stockholm Fringe Festival” and “Alto Fest” in Naples. From ethnographic sources it is known that in remote areas in the Carpathian region there was an archaic ritual in which during delivery man sat in front of the house and went through the functions a laboring woman. “The Reborn” film is about sharing the responsibility. It is dealing with gender study research. Oksana Chepelyk was born in Kiev /Ukraine/, where she lives today, she studied at the Art Institute in Kiev, 1978-1984. Oksana Chepelyk followed a post-graduate course in Moscow, 1986-1988, the Independent Residency Program, CREDAC, Paris, 1996, the New Media Study Program, the Banff Centre for the Arts, Canada, 1998, Bauhaus Dessau, Germany, 2000-2002, UCLA, USA, 2003-2004 and 2010-2011. She works as multimedia artist with video, performance, photography, installation and painting. Oksana has widely exhibited internationally. She has been working on experimental video films since 1994. Chepelyk has shown her works at the numerous festivals worldwide and has received the prizes. Nathalie and Timothée have been working together for several years after they met at film school in Paris. They first effort together was a 1 minute film shot with an Iphone called “The Girl with the Red Balloons” who went on to win prizes and have been selected at different festivals worldwide. They have just completed their first produced short movie called “L’usine, l’autre nuit” (The Other Night Factory). The mummer’ is inspired on the Kukeri festival which I have visited in Bulgaria. Kukeri is a traditional Bulgarian ritual to scare away evil spirits, with costumed men performing the ritual. The costumes, made of sheep- or goathair, cover most of the body. The men walk, run and dance wildly on the street. The material and the movements make them into walking wild sculptures. This inspired me to make the video ‘the mummer’ in which a woman is covered with contemporary feminine material: Scarfs, only her legs are visible. She is guided by the material. By dancing in front of the camera also turns this woman in each sequence to an ever changed sculpture. Nynke Deinema was born in 1963 and studied Fine Art at the Gerrit Rietveld Academy, Amsterdam and on the UdK (former HdK) in Berlin. She works with different media. Her videoworks combine the body and the material. She is interested in the human being and his peculiarity. Recent video works have been screened at the Art Video Screening (Orbero/Sweden), Internationale Video et Art Electronique, (Montreal/Canada), Facade Video Festival (Plovdiv/Bulgaria) Numerous exhibitions, works in public spaces and publications. It is an animation made from photos of the artist’s face being rubbed by hands. Animation frames are manipulated digitally making his features, now transform, sometimes disappear. Born in Montevideo, Uruguay in 1971. In 1997 graduated in the National School of Fine Arts, Republic University, Uruguay. Since 1993 participates in several solo and group exhibitions as the Centennial Exhibition Prize Art Biennale of Venice in 1994, organized by the Museum of Contemporary Art Exhibition and in 1996 the United Airlines Exhibition at the Museum of American Art. Living in Florianópolis since 1999 exposes individually several times; at the House of Culture Estacio de Sa with “Drawings of Non-self” and “SoundSet”, Museum of Image and Sound. Since 2010 has participated in contemporary art contest whith video art. DONAU is an ongoing collaboration between illustrator and designer Daniel Lachenmeier (*1983) and artist Andreas Thierstein (*1979). They live and work in Basel, Switzerland. wo videos of common matches – burning down with invisible flames – point up how the personal point of view can influence our subjective perception of a process. A brief meditation on observation and the act of looking. Jonathan Johnson is an artist-educator who uses various forms of photography and video to explore ideas about place and nature. Johnson has exhibited his films and photographic work in over 30 countries at venues such as the Museo Nacional Centro de Arte Reina Sofia, Madrid; Wexner Center for the Arts, Columbus, Ohio; Galleria Sment, Braga, Portugal; Africa Centre, Cape Town, South Africa; Sofia Arsenal Museum of Contemporary Art; Keuruu Museum, Finland and the EXiS Film Festival, Seoul, South Korea. In addition to working in academia, he has held positions in public affairs and in the music industry. Currently, he is an Assistant Professor of Photography and Digital Media at Otterbein University in Columbus, Ohio. spectator follows the progress of the object on the body, the progress of the shearing at the rate of the electric appliance. The matter disappears progressively. The body is laid bare a second time by removing all its hair. It appears as a complete smooth surface. The title 0000000002 insists on the idea of the loss of the identity. This body becomes anonymous. Laurie Joly is an artist and a researcher born in 1984 in Lyon (France). She actually lives and works in Paris (France). the Paris – Est University and the Research Lab EMeRI / FDM at the Ecole Nationale Supérieure des Arts Décoratifs of Paris. She participated in group exhibitions, Video Art and Cinema festivals and in international conferences. She wrote several articles. Lead by the interpretation of the term “Post-history” by Croatian theoretician Zarko Paic who talks of the end of ideology as the end of history, globalization era that begins after 1989 by the turnaround of the liberal-democratic revolutions in Europe and the world, through my work I research the principles of art theory that is connected to the term “Post-history” and through the artistic process research the term “Integral reality” by documenting it. The process of aestheticizing the world is taking place in post-history. The society is an aestheticized post-industrial society. It is driven by a scientific-technological development, and its ideological justification is provided by the post-modern culture of spectacle. Lucija Konda Labas was born in 1975 in Zagreb, Croatia. In 1999 she graduated Painting at the Academy of Fine Arts in Zagreb. She attended MA in Painting at the Academy of Fine Arts in Ljubljana, Slovenia. Fields of her activities are painting, video, artist book and photography. She is a member of the Croatian Association of Artists and a member of Matrix Croatica. She works at the Academy of Fine Arts in Zagreb as a Docent. She exhibited artworks at home and abroad. In 2012 she completed Postgraduate doctoral studies at the Academy of Fine Arts in Zagreb and thereby obtained the academic title – Doctor of Art (dr.art.). No words are needed. Photography is realted to the theater. The stage is the frame. The freezing dance pose is similar to photo deduction. The abstraction, paper handling and synthesis of sound and movement is the essence of this experimental piece. Igor Krasik was born in 1982. At the age of 4, he started taking violin lessons at the music school and conservatory in Minsk. At the age of 17 he entered the world of dance. In 2006, he was enrolled in Media Design Studies at the University of Applied Sciences of Schwaebisch Hall and studied abroad at the Cleveland Institute of Art (USA). 2008, he has been working as a student at RTL Television in Cologne/ Germany. Igor also become an independent media designer in film production. In 2010 he graduated with a Bachelor of Arts in Media Design supervised by Prof. Friedemann Dähn and Prof. Beate Ehrmann. Since 2010 he has studied at the Film Academy, Baden-Württemberg, in Ludwigsburg supervised by Prof.Dr. Heike Sperling. He is graduated in 2013 with a Diploma in Motion Design. Figures falling through space, time and memory, trapped in a limbo between feelings and reality. An animation about how we are constantly viewing the world around us through simulation constructed by mass media and accustomed to objectifying the body and identity, but when the idea of death suddenly becomes real to us, then we do not know how to deal with it. The animation starts with a floating petal and a road leading somewhere. The camera surfs through this rose like structure. Many water molecules transform into different forms during the journey. In the end, the camera dolly out to an overlook angle revealing that image consists of many similar rose structures. Then the camera dolly in the structure again. The journey is actually an endless cycle along the path. Love is blind. We often lose our sensible mind when we fall in love. It seems like within the rose structure that we can only see some elements or those items. We don’t see the overall picture until we pull ourselves out of the situation. But we often got attracted in this fantastic illusion over and over again. If water has its soul, it knew the cycle will end where it begins. Somehow it still embarks its indefinite journey for the sake of love. It’s something magic, isn’t it? Jerome Chia-Horng Lin was born in 1969, Taipei city. He was trained to be an artist since he was young by attending an art program in junior high school. He went to Pratt Institute, New York City at 1997 for his master study. He started to learn computer animation as his medium for creation since then. His final project “Dainty” was selected and presented at CYNETart 2000 ( Dresden, Germany). Later on the animation anticipated many exhibitions at New York City, Taipei City, Hsin-Ju city and Shanghai city. For years, he uses computer animation as well as oil paintings for his art creation continuously. He currently is the Lecturer of Department of Visual Communication Design, Chaoyang University of Technology (Taichung city, Taiwan). “Semaphore” explores a the temporal and material process involved in drawing and the schism between the concrete and the abstract. Grant Petrey joined the School of Fine Arts as a Senior Lecturer in Fine Art Media at the University for the Creative Arts, Maidstone. Having taught Fine Art at Canterbury and worked extensively on a number of education and curatorial project with Turner Contemporary, Margate he now is based at the Farnham campus teaching theory and practice, as well as being an adjunct lecturer at Cornish College of the Arts, Seattle. He has presented his research and practice internationally and early painting work is part of the National Collection of Great Britain & Northern Ireland. Olga Poliektova and Tatiana Poliektova, twin sisters were born in St-Petersburg, Russia. Since early years they began to draw and graduated Art school. After graduating at the University of Cinema and Television in animation and computer graphic, they started to work together as film director duo and animators. Lisi Prada lives in Madrid and works as adviser in a teacher training center, in the area of arts and music. She has received some distinctions like: poetry film (Zebra, 3 best [meine heimat]. Babylon Kino, Berlin, 2012), videoart (MADATAC and Transfera. MNCARS, Madrid, 2011), abstract visual music (Dot and Line. MNCARS, Madrid, 2011) and videoperformance (MoviFilm. Academy of Motion Picture Arts and Sciences of Spain, 2009). He has also participated in different programs and his films has been shown at Madrid in museums, art spaces and galleries. Also in other cities of his country and in more than fifteen countries. 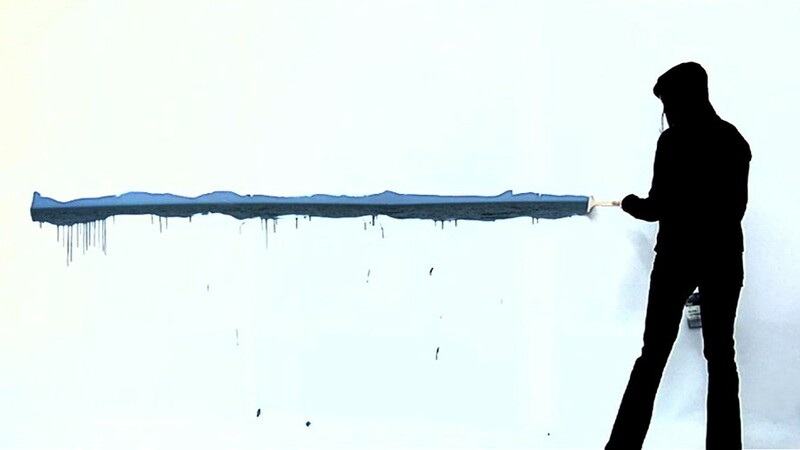 The artist is drawing a line onto a white surface. The line reveals the horizon: it separates the sea from the sky. Johanna Reich is a video artist working also in the fields of performance and photography. Her recent projects question modern technology and the use of digital produced images. Johanna Reich received national and international awards and scholarships like the Nam June Paik Award (2006), the Excellence Prize (Japan Media Arts Festival, 2007, Tokyo), the Media Art Award NRW, (2009) and the GWK Art Award (2010). In 2010 she was resident at Künstlerhaus Schloß Balmoral and Fabrica de Pensule Cluj, ColectivA, Romania, in 2011 she was rewarded with the Konrad-von-Soest Preis. 2012 she received the scholarship „Präsenz vor Ort“. Vandekeybus, and key teacher of Idocde (International documentation of contemporary dance education). Water, earth and air can symbolise aspects of the psyche, respectively the unconscious, the limited perception of our ego-consciousness, and our spirituality. Areas of work: photographs, digital images, video art and installations.From 1988 solo exhibitions at the City Gallery Bremerhaven and other galleries in Bremerhaven and Bremen, Germany. Solo exhibitions since 2001: Cube 37, Frankston; Kinross House, Toorak; Chapel on Station, Box Hill (incl. video installation) (all in Melbourne). A man build and un-build a structure with white cards. Film inspired by horror movies. A second piece from the Great Magician Series. Born in Portugal in 1962. High Degree in painting and Master Degree on Aesthetic Communication (Digital Art) by the University Art School of Coimbra. Curator of FONLAD Festival (http://www.fonlad.net/index.html), UAVM Virtual Museum (http://www.uavm.net) and Web Art Center (http://www.webartcenter.org). Exhibitions and screenings in Portugal, Spain, France, Italy, Greece, Romania, Germany, UK, China, USA, Brasil, Mexico, Argentina, Australia, etc. The old process of creating the food has changed in the technology of production. The magic of creating art changed technology to create art. Fast, easy, shallow. Fast Food – Fast Art. I was born in Poland in 1971. I received my degree in Painting from the Academy of Arts in Poland (1997). I am currently living and working in Hanover, Germany.